Sometimes I like to cast on a new project when my current project comes to a standstill. Usually, this standstill is a result of me being indecisive as to whether or not to rip back or frog the project, or the project simply requires more brain power than I'm willing to/can give at the moment. Since I just want to do the act of knitting, I'll "solve" this problem by casting on something new. I know, I know...that's not really a solution to my knitting problems and can sometimes add to the problem if I run into an issue with the new project. I'm going to put it out there right now that there's nothing wrong with my Pixel Rise socks. I'm just a fickle knitter with the brain of a magpie. Nothing amplifies this point more than this new project that I had cast-on just two weeks after starting the Pixel Rise socks. 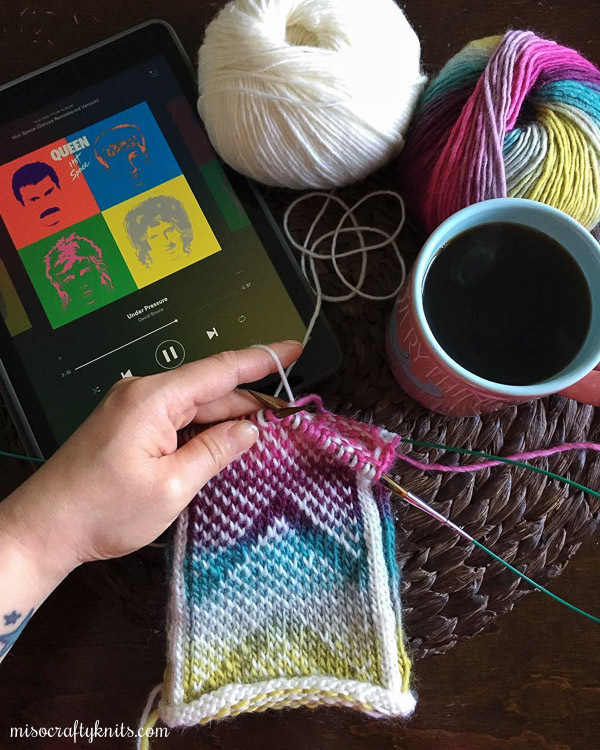 I've been wanting to knit up Andrea Mowry's Wanderers: Modern Mukluks pattern for months and months but had always put it off because I had too many WIPs on the needles or because I had knits with deadlines. Then last month I decided enough was enough. I'm an adult and I can knit whatever I want, when I want. 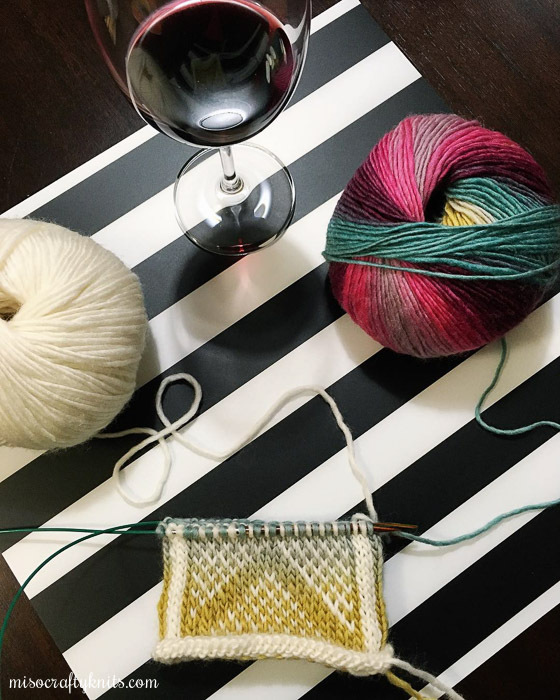 So I dug through the stash and found the balls of yarn that I had saved for the mukluks, and with a glass of wine by my side, I finally cast on Wanderers. The very last time I made a Knit Picks order I added two balls of Chroma Worsted - one in white and one in a colourway called "Party Hat", specifically to knit up a pair of Wanderers with. I'm absolutely LOVING how these yarns and this pattern are knitting up together. I REALLY wish I had ordered more than just one ball of Party Hat. I simply cannot get enough of this colourway!! The colourway itself and how it's knitting up is way more than I had expected. As for the pattern, I'm only on the first chart and so far it's been a pretty easy knit. The chart makes it really clear as to which stitch is used in which yarn and once I got the first repeat under my belt I found that I only had to refer to the chart only once in a while to make sure I'm on the right track. After two repeats I was able to "read" my knitting and only had to look at the chart if I had taken a break and needed a refresher as to where I was on the chart. With all that said, I have hit a little bump with the first slipper. 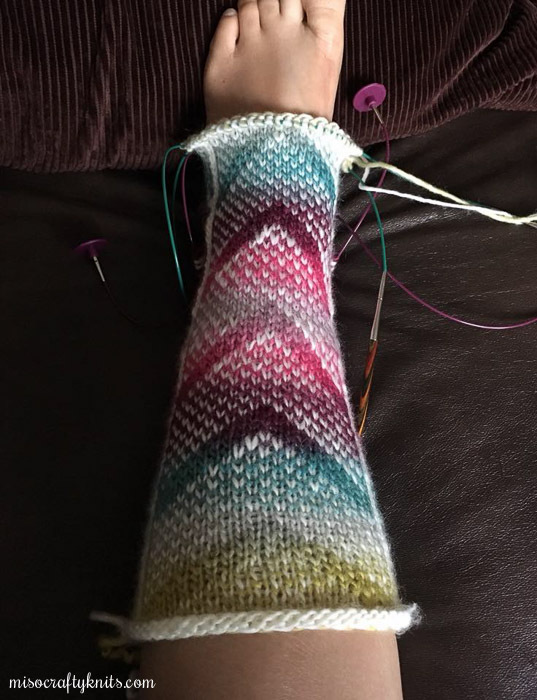 The colour repeat in Party Hat has decided to go in reverse from a bright pink to a dusty rose and back to bright pink, from mid-calf to right above the ankle! I kept knitting though, cause I wanted to see how the colours would play out. I had put in the waste yarn for the afterthought heel and kept knitting onto the foot. Out of curiosity as to how it would look on my foot, I put the heel stitches on some extra cables and tried on the slipper. Yeah...I'm not sure if I'm ok with the double stripes of bright pink. And I'm not sure if this will bug me or not. Instead of letting this colour snag stop me from knitting on this project altogether, I decided to do what I think any knitter would do (hopefully! ): I went ahead and cast on the second slipper to give myself a chance to "sleep on it". I weighed out both balls of yarn, saw that I had more than enough of the white, and divided the rest of the Party Hat so that I knew how much I had left for the first slipper (which is now a bunch of colourful rings - as you can see in the first photo of this post) and saved the last half of the ball for the second slipper. I got lucky in that the other end of the Party Hat ball is the same colour sequence as the beginning! So I was able to move forward easily by simply using the other end of both balls. Sweet! While I'm keeping my fingers crossed that I don't hit a similar snag on this second slipper, a huge part of me knows that this is most likely wishful thinking. But I'll make a final decision as to what to do when I get to that point. In the meantime, I'm going to knit, knit, knit! I don't knit colourwork as often as I would like to and in fact, had made it a goal one year to do more of it (but then never did any). 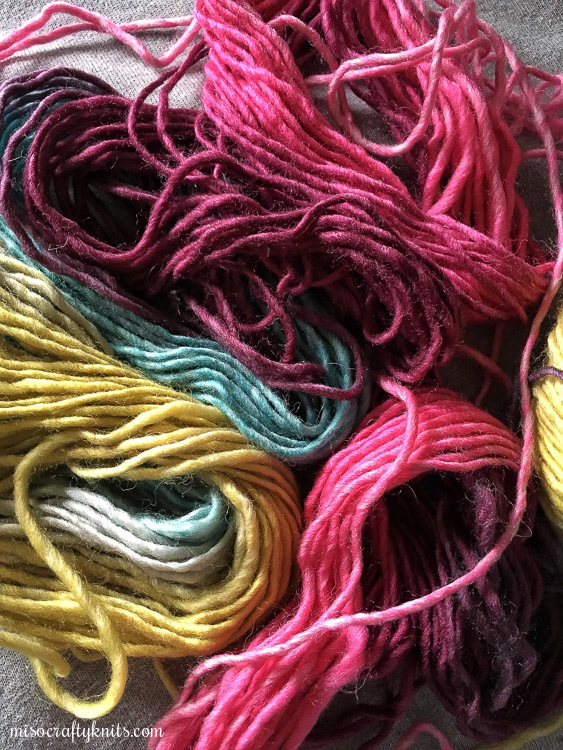 My issues with colourwork: one, I definitely have to work on my tension issues, especially with the contrasting colour (which is the white), as I hold that strand in my left hand and knit it continental-style; and two, I don't really like to take colourwork projects out of the house. Hopefully, I can get these slippers knitted up and off the needles before the weather gets too warm so that I can actually wear them. Wish me luck that I'll make a decision about that double pink stripe before I either finish the second slipper or get to the same spot on the second! Your post is astonishing and most valuable to made savvy identity. Men Biker Boyz Leather Jacket Much thanks to you such a great amount for sharing us.